Lets get one thing straight: I love Napalm Death. They are without any doubt my all-time favourite metal band. I have every album, except "Suffer the Children", "Harmony Corruption" and "Utopia Banished" (although I'm pretty sure I used to have it, so if you borrowed it from me, please give it back). There - now that you know how I feel about ND, we can get on with it. Last night I wen't to part one of the 2009 Metal Royale (a two day, indoor metal festival) here in Aarhus, Denmark (my hometown). Obviously to see ND. There were other bands playing as well, but I was there for ND - so this review is only about Napalm Death. Now I haven't seen them since they were here shortly after relasing the ground-breaking album" Fear, emptyness, despair", which I also consider a musical turning point for ND. With Fear... they took in a completely new style and sound which went right in with me, and just seemed to get better and better with "Diatribes" and "Inside the torn apart". And the gig promoting Fear... was fantastic. Great sound and great music. And this was more than ten years ago now. Obviously I had HIGH expectations. But sadly I was royally disappointed. Not by the band, or the fact that they didn't play any of my favourite tracks from Fear..., Diatribes, or Inside... They've been around for almost 30 years now, and have an impressive catalogue of music. In fact, the set was really well composed - fastpaced and energetic, to support the pace of the upcoming album "Time waits for no slave", which is proably the fastest album from ND in a long time. And front man Barney, did a good job of stirring up things with his manic and almost spastic act and gesturing. No the band did absolutely great. On a sidenote, I really miss Jesse Pintado (R.I.P.) 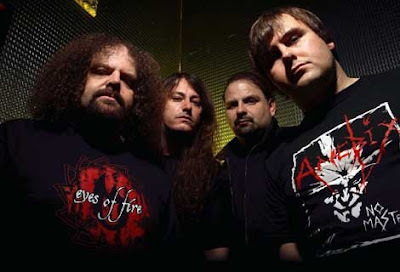 in Napalm Death. And I think they should get a 2. guitar player again - at least for the live shows. It just doesn't sound the same with just one.